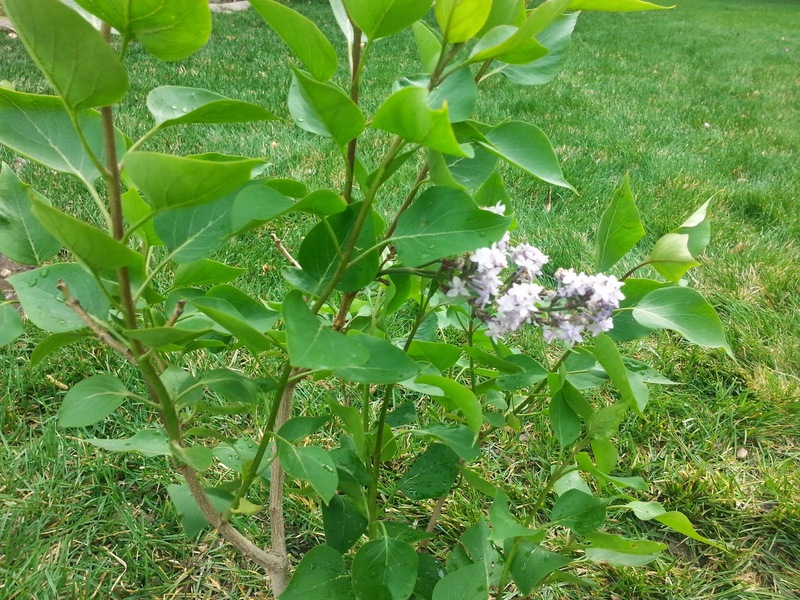 The Lilac planted five years ago when my oldest son was married. Lilacs have always been a favorite with me. The inspiration hit that rather than a fence, I could grow a lilac hedge. It would be prettier, less expensive, and less likely to blow down in a Davis County East Wind. It will take about five years to fill in as a solid hedge. We have the time. Robert Frost reminds us that "something there is that doesn't love a wall" (or fence). I feel the same. The popular things now are the white, vinyl fences in their plastic shine. But they were the first things to go in the East Wind. Why lilacs? So many reasons. They're an old-fashioned type of landscape. Pioneers grew them. Huge, old, lilacs are often found next to the old, stone houses of Davis County and pioneer homes throughout the Mormon Corridor. Whitman evidences us of 19th Century popularity, "When Lilacs Last in the Dooryard Bloom'd," a great homage to his fallen Captain, President Lincoln. The President was shot on a Good Friday, a national sacrifice for Union. 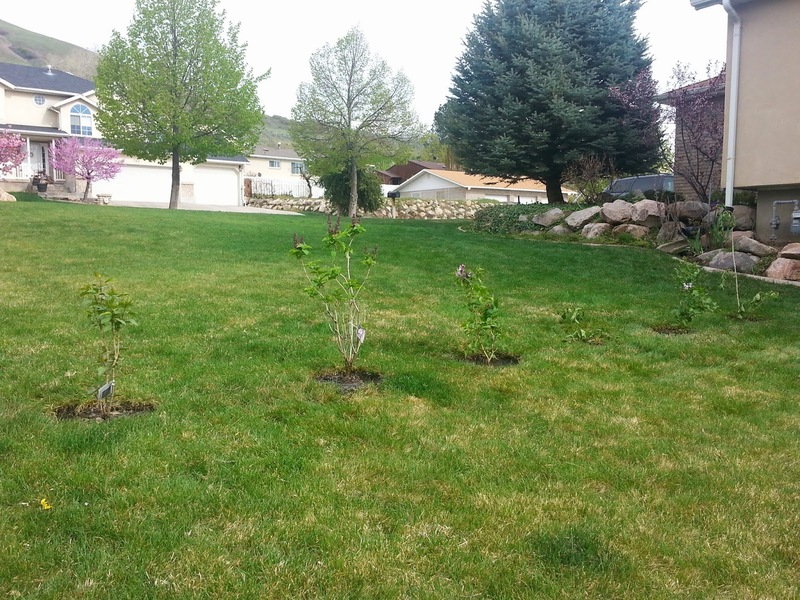 The Utah State University Extension Service gave me some ideas for a hedge. Their website suggested to plant bushes 3-6 feet apart. Hoping for a good barrier in the place of a fence, I went with just over three feet. 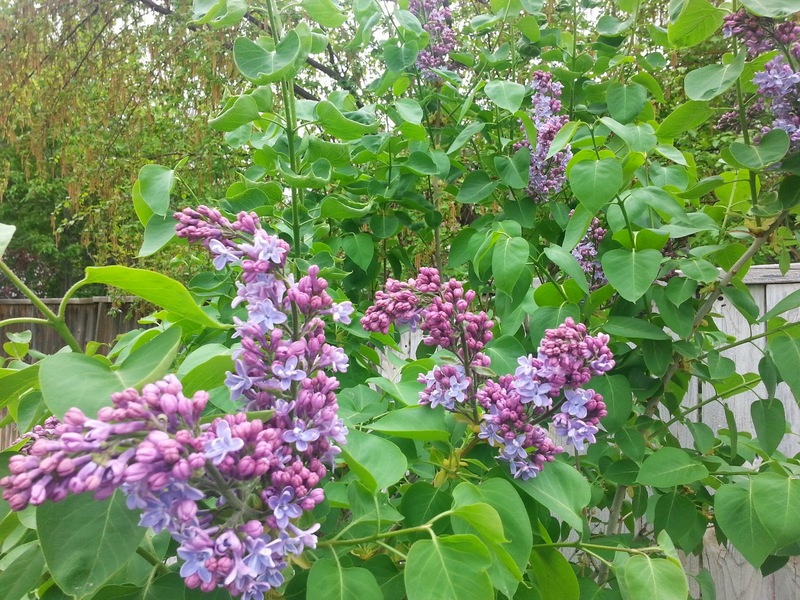 They also said to plant a variety of lilacs as different varieties bloom at various times with different hues. Our standard syringa vulgaris planted five years ago, gave me a couple of shoots I transplanted. They're going through a bit of shock, but they look like they'll recover. I also bought a "Katherine Havermeyer" variety that has lavender-purple flowers that fade to pink. The lilac hedge - just give it five years. This Good Friday, I had to drive to Provo for an afternoon meeting. Of course I was listening to Wagner's Parsifal on the way down. After the meeting, I Googled to see if there was a plant nursery close by. I found McCoard's Garden Center out by Utah Lake. But not finding the lilacs, I had to ask. The lady led me too a table where the small pots of plants were blowing over in the wind. Recognizing the "Miss Kim" which I knew was a dwarf variety, I asked for varieties of the syringa vulgaris that would grow to full size. I probably won't last the life-span of the lilacs, but my grand or great-grand kids might be around. Then I saw a variety tagged "Evangeline." That's my granddaughter's rather unique and beautiful name! My wife said the find was inspired. I planted that one between the two starts from the lilac I planted for her mom and dad. On the way home, I was anxious to plant for Evangeline. Parsifal was still playing.
. . . die Wunde ist's, die nie sich schließen will . . .
We are all wounded. We will all be healed. That's Good Friday.